This months Thoth Tip focuses on Lust – this card is number 11 and in other decks often called strength. 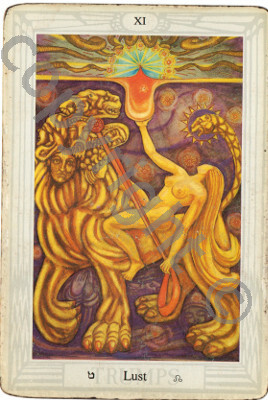 Crowley emphasised the driven obsession side of the card – where we have to exert personal strength to keep ourselves in balance when faced with our primal desires. This can take the meaning of lust to a wider sphere too where we can have lust for life and passion for many things in our lives but if we act on our ‘lust’ to the exclusion of all else our lives can become imbalanced. All training in our favourite sport and no rest, as much as watching our favourite TV show 24/7 with no activity, any extreme turns out to be bad for us, however with awareness we can live out our passions whilst also keeping in check when they become self-destructive and against our highest good. So taking the meaning further to include the enjoyment of our own self-imposed boundaries, the finding the balance and having the strength to say no to our desires every whim brings a joy in itself – a knowledge we are in control of our lives and that we are not at the mercy of our feelings and desires, but can harness them to good use. The image shows this well with the woman having a strong hold of the reigns whilst also surrendering to passion and fire in herself. We have the picture of containment of our desires without repression. The ground upon which the beast walks contains images of saints and traditional images of prayer where the ethos is to offer up to another our power. To ask another to judge us as good or bad, the other being representative of a higher being who ultimately judges us – this is what paved the way for the new age – age of Horus. In the new age we are responsible for our own actions and judgements we need not give our power to another but seek our own personal connection to the divine, and honour all parts of ourselves even the traditionally darker parts. As we come to love ourselves fully so we gain the strength to contain them without denial. When lust shows in a reading it can represent the simple idea of being ‘in lust’ with someone but more often it is showing us our passions and our raw feelings are available to us and need not be avoided – we have the strength to see them, explore them and also be in charge of them – though part of us will be intoxicated by them as the woman on the card is, we can also have a grip on ourselves and form boundaries of expression that are for our highest good. We are in charge. We can have great joy and fun and know when we need to stop.